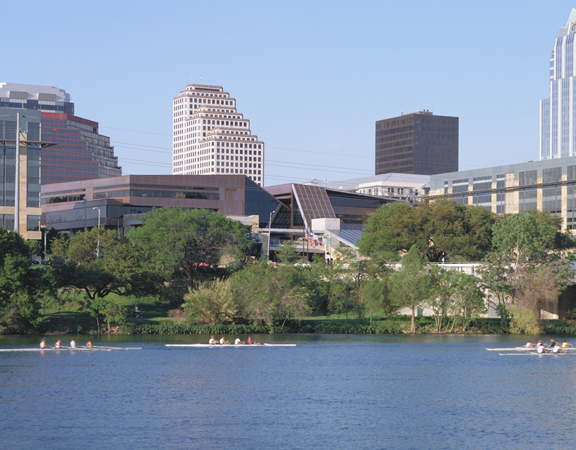 The new Austin City Hall and public plaza graces the shores of Lady Bird Lake at the edge of the dynamic Warehouse district, an area that is rapidly being transformed into a tight grid of restaurants, nightspots, housing, and mid-rise office spaces. The new city hall, completed in the fall of 2004, terraces down to the lake from Second Street, mediating between this busy city grid and the natural realm. 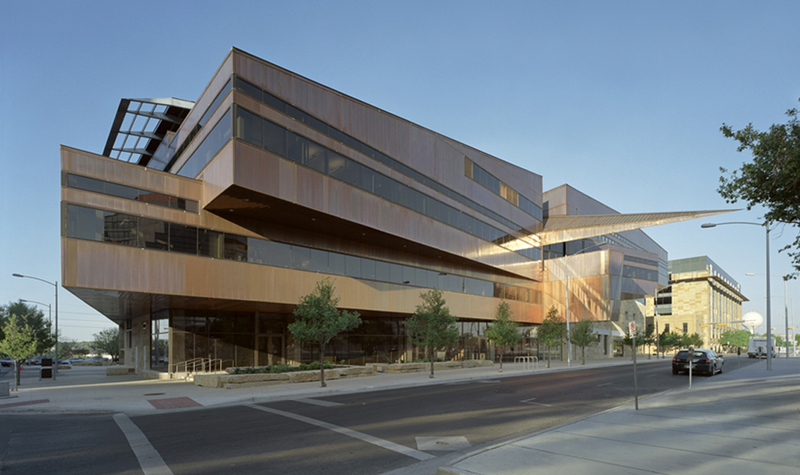 Antoine Predock, in association with Cotera, Kolar, Negrete, and Reed, designed the building not as a "suit-and-tie" city hall, but rather as a reflection of the warm informality that characterizes Austin. This is embodied in part by the way the structure angles away from adjacent streets, standing in contrast to the formality of the surrounding grid. 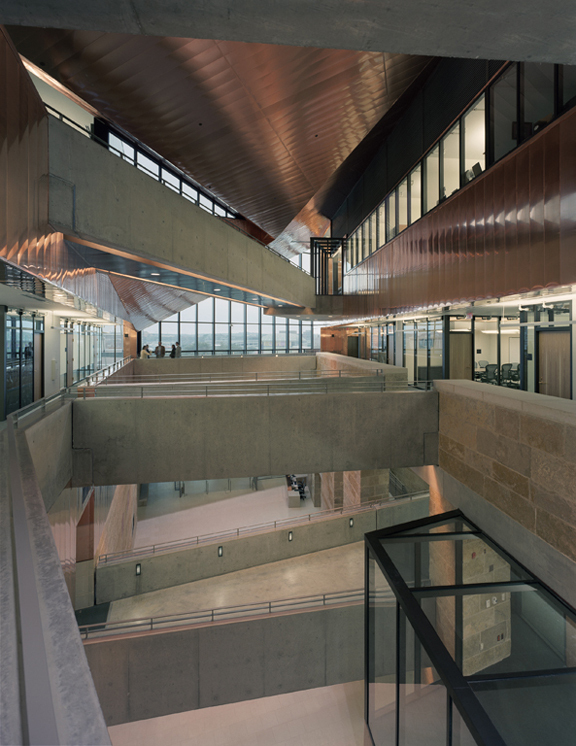 These inflections from the urban perimeter also create several mini-plazas around the building, further encouraging informal gatherings, and they also allow oblique views toward Lady Bird Lake from inside the building. Landscape dominates the project. A massive arc of Lueders limestone, emerging from bedrock at the lowest level of the parking garage, anchors the project to the site. Metamorphosing out of this wall is a limestone base that encloses the first two stories. A scrim-like copper skin, resting on the limestone base and capped with a folded copper roof, encloses the upper levels. As the arcing wall cuts through the building it creates an open four-story lobby transected by catwalk-like bridges at each level. 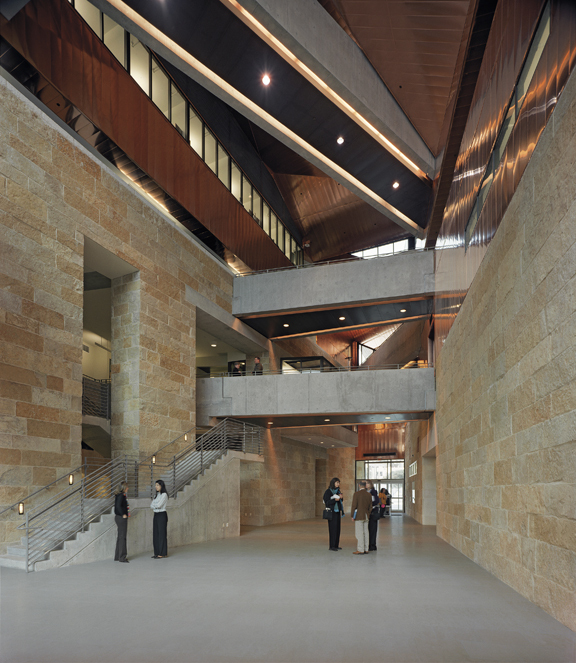 A reflective copper ceiling over the lobby reflects light from a skylight into the space below. 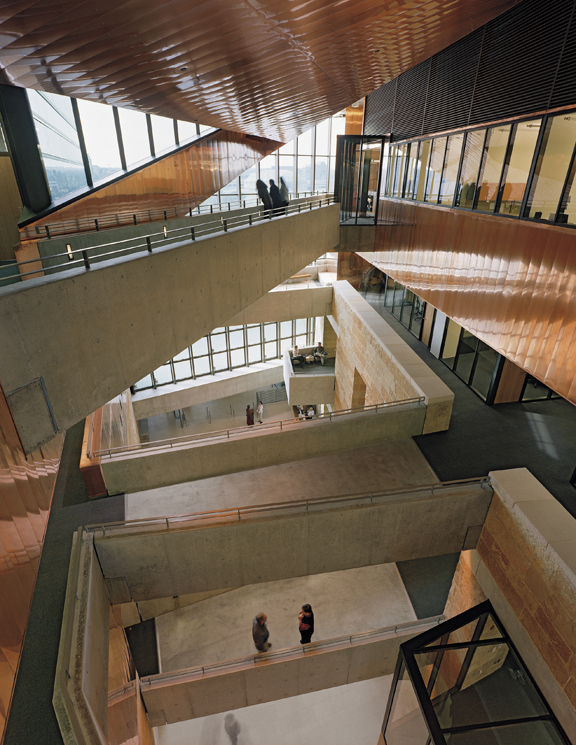 On the exterior, limestone, copper, glass, water and shade come together to create the city's "living room." 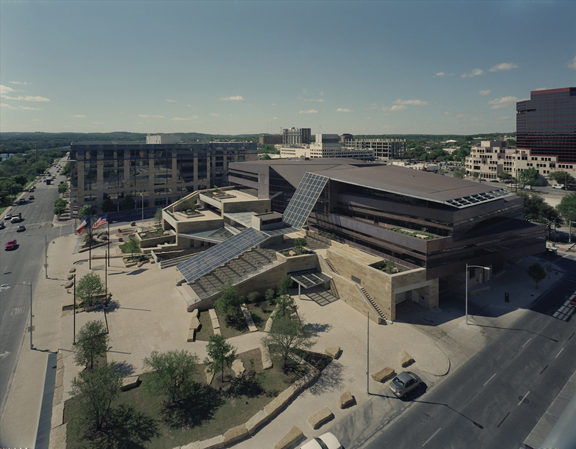 Terraces spill out of the building into the plaza in the same way the geologic forces in Austin's hill country produce the limestone overhangs known as balcones. These terraces, shaded with trees are prime locations for viewing the activities on the plaza below and Lady Bird Lake beyond. The plaza winds its way around the limestone peninsulas of the terraced building. 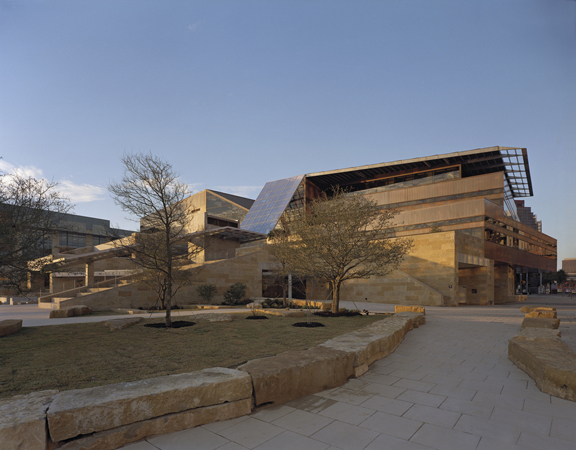 Water originating from the canyon-like space inside the building runs through a group of monumental limestone boulders in the plaza to symbolically return to Lady Bird Lake. The plaza contains a limestone stage for performances, with amphitheater seating that descends from the main public terrace. 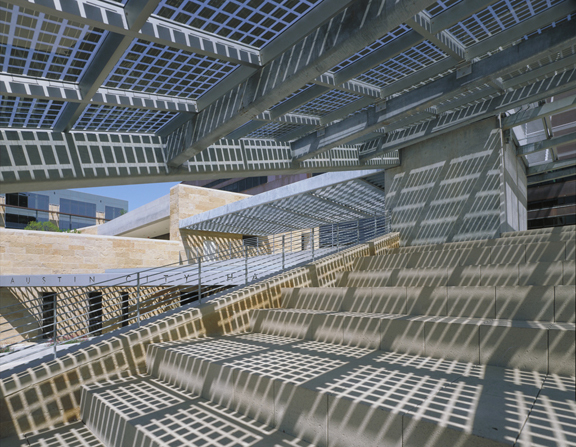 The amphitheater is protected from the sun by a trellised structure made up of photovoltaic cells.